Dates, Egg Whites, Almonds, Cashews, Blueberries, Natural Flavors. Contains: Eggs, Almonds, & Cashews. 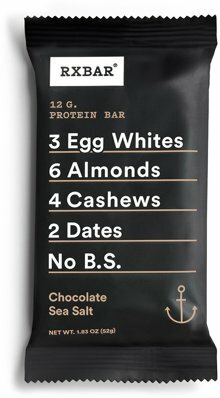 Dates, Egg Whites, Almonds, Cashews, Chocolate, Natural Flavors, Sea Salt. Contains: Eggs, Hazelnuts & Cashews. Dates, Egg Whites, Hazelnuts, Cashews, Chocolate, Cocoa, Natural Flavors. Dates, Egg Whites, Cashews, Almonds, Chocolate, Cocoa, Natural Flavors, Sea Salt. Dates, Egg Whites, Almonds, Cashews, Chocolate, Natural Flavors, Sea Salt, Coconut. Contains: Eggs, Almonds, Cashews & Coconut. Dates, Egg Whites, Almonds, Cashews, Chocolate, Natural Flavors, Cocoa, Sea Salt, Coffee. Dates, Egg Whites, Almonds, Cashews, Mango, Pineapple, Natural Flavors. Dates, Egg Whites, Cashews, Almonds, Chocolate, Cocoa, Mint, Natural Flavors, Sea Salt. Dates, Egg Whites, Almonds, Cashews, Cranberries, Strawberries, Raspberries, Natural Flavors. Dates, Peanuts, Egg Whites, Chocolate, Natural Flavors, Sea Salt, Cocoa. We tell you what’s inside on the outside. Because we have nothing to hide, we’re upfront about what’s in our bars, what’s not, and what RXBAR stands for. Yes, we make protein bars. But really, we’re in the egg business, and the date business, and the nut business. You get the idea. We keep things simple so the core ingredients are everything. Our core ingredients are all there for a reason.